It wasn't long ago that the junior parkrun series only consisted of about 3 or so venues. However, the junior series has grown quite significantly during the last year, and we decided to visit Mile End Junior parkrun for Matilda's very first official parkrun. The Mile End Junior parkrun takes place in Mile End Park, in East London, on part of the original 5k Mile End parkrun course. I visited the full 5k event back in September 2013 and as I was back in the park, I decided to squeeze in my Sunday running by completing two freedom runs - one on the 5k course and another on the 2k course. With those done, it was time to hang out at the start area and wait for the run to begin. Now, by complete coincidence we had turned up on the same day as the Join in crew, who had brought with them Great Britain athlete (with an Olympic bronze to her name) Kelly Sotherton and a film crew from ITV news. I offered my services as a volunteer but they had all roles covered so I was free to wander the course with the legendary Craigie-Lee Paterson offering encouragement to the 13 junior runners. As far as facilities go, there are toilets, showers and changing rooms right next to the start. You can park for free on Copperfield Road. Mile End tube station is adjacent to the park and gives easy access to anyone travelling from a little further than the immediate local area. 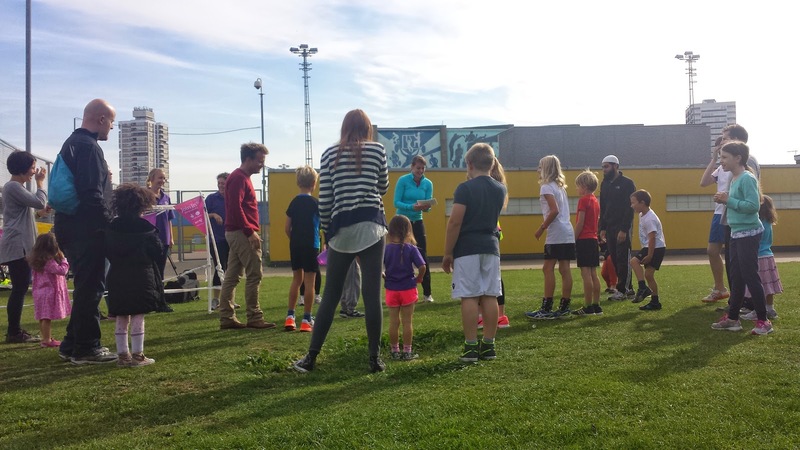 Before the run started, the children were treated to a fab pre-run talk from Kelly Sotherton who then went on to lead them through a brilliant warm up session. She also presented some of the regular runners with their junior parkrun wristbands. I had never seen Matilda so excited about, well, anything - she had been asking to run with the children for ages and had woken up at about 6am that morning really excited and bouncing around the house, eager to get to the 'baba race' as she calls it! The run starts at the same place as its 5k sibling and heads off in a northerly direction following the left side of the double paths. The course consists of two laps of a 1k out and back route which takes place on the park's double paths. The runners head out on the left hand path and has some really nice sweeping curves and even a little hump (which must seem like a proper hill to those tiny legs) for the juniors to tackle. So after weaving around to the far end of the course, the runners perform a 180 degree turn and head back along the other side of the double path. There are marshals positioned roughly every 100 metres or so and they are absolutely wonderful - encouraging the kids and offering hi-fives all the way around. Matilda was joined by her cousins Holly and Luke for today's run - they had both previously run at Bushy Junior parkrun on a few occasions so it was good to see the three of them out there together enjoying the course. Once the run had finished and barcodes had been scanned all three of the Stockwell juniors were interviewed by the ITV film crew, which was totally unexpected and really exciting for them. (I'll add a link if the piece is put online). The results were online a short while after and Matilda had managed to open her junior parkrun account at the age of 4 years and 5 days old with a time of 19.44 and scored a 40.54% age grading. It is a great little course and I am pretty confident in saying that we'll be back here in the future. Matilda was also mentioned in episode 155 of the parkrun show 'pygmy mammoths'.